artists engaged with syncing rural, urban and digital spaces. You might be reading this on your smart phone, tablet or another device, in which case you are already involved within Polyspace. The concept for the exhibition stemmed from conversations about spatial relations in the digital age, at a time in which space has been reconfigured and expanded by new technologies. A group of artists interested in Polyspace came together to discuss how we understand and express these developments. Conversations throughout Summer 2016 drifted between subjects such as Bitcoin, internet art, ontology, the physical presence of the internet, and even Kate Bush videos. The artists examined the fluidity between objects, bodies and spaces, that through digital technologies stretch and alter our perceptions of ‘real’ environments. The works allude to an artistic process as collaboration between artist and technology. 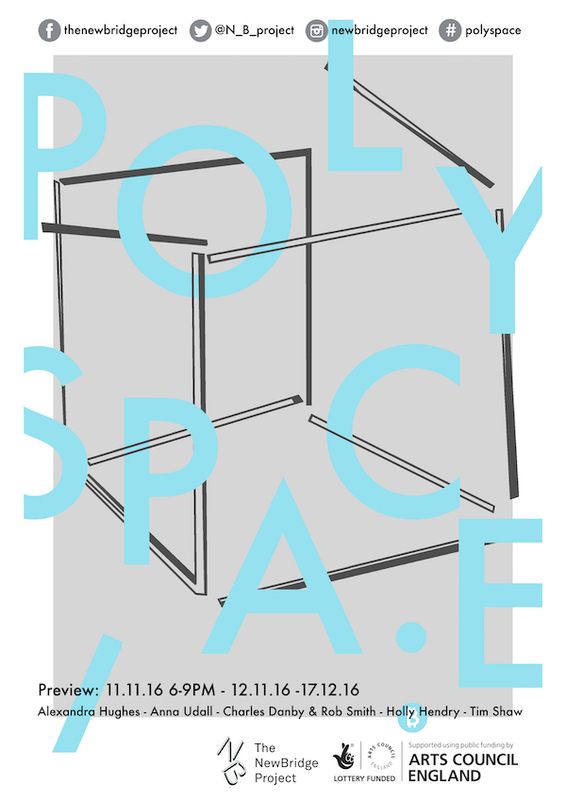 Polyspace was conceived as a neologism, which best epitomises the modern approach of working with varied spaces as a subject matter. These spaces explore technology (digital), architecture (urban) and nature (rural). The exhibition featured works in mixed media installations, prints, sculpture and internet-enabled sound art. Holly Hendry (b.1990) lives and works in London. She graduated in 2016 with an MA in Sculpture from the Royal College of Art, London having gained a BA (Hons) in Fine Art from Slade School of Fine Art, London in 2013. Solo exhibitions include; BACKWASH, The Door, Rice & Toye, London, (2016), More and More, More is More, Bosse & Baum, London, (2015), VISITS, Curate Projects, London (2015) and Hollow Bodies, Gallery North, Newcastle, (2014). Selected group exhibitions include; Short Term Storage, Limoncello Cork Street, London (2016), We’ll meet you in the gold room, Collar MCR at Manchester Contemporary, Manchester (2016) and Getting’ the Heart Ready, The Royal Standard, Liverpool (2016). Alexandra Hughes is an artist with a practice in the field of expanded photography. She undertakes physical explorations of the photographic medium, bringing image and material together to redefine the photographic object. Hughes creates mixed media installations with a sense of fluidity, permeability and fragmentation, investigating the multiplicity and production of altogether new sites, meanings and encounters, blurring the boundaries between landscape, technology and psychological and architectural spaces. Alexandra Hughes (b.1982 Canada) currently lives and works between Newcastle and London, UK. Hughes was recent artist-in-residence at Roaming Room Artspace, London UK (2016). Past exhibitions include; SIA Gallery, Sheffield UK (2016), Vane Gallery, Newcastle UK (2014), The Whitworth Art Gallery, Manchester UK (2011), Sanhe Museum, Hangzhou China (2010), and Real Academia de Espana en Roma, Rome Italy (2010). Tim Shaw has worked internationally as an artist, performer, sound designer and researcher. His practice is situated within media art and draws upon soundscape and electroacoustic composition, performance making and DIY technology. Shaw has recently presented work at ARC, Switzerland (2016), Stereolux, France (2016), APO33, France (2016), Eastern Bloc, Canada (2016) and The Wired Lab, Australia (2016). Charles Danby and Rob Smith have worked collaboratively since 2011, exploring distributed site and land use in the transforming industrial landscape of the UK. Their work incorporates a materially engaged use of video, photography, and digital technologies alongside a critical investigation of curatorial and archival approaches. Recent projects include Limelight, PEAK and Cardiff Contemporary (2016), Parallel Cipher, Northern Charter, Newcastle (2016), Revisiting the Quarry Symposium, Yorkshire Sculpture Park (2014) and The Quarry, IMT, London (2013). Anna Udall (b.1989) currently lives and works in London, she graduated in 2013 from Northumbria University. Anna’s work explores our relationship with technology whilst bringing into questions the value, authorship and originality of the art it produces. Recent exhibitions include Free Range, Old Truman Brewery, London (2013), Consider, Converse, Context, Whistle Shop Art Stop, Haltwhistle (2013), Sacked Art Grand prix, Sakaide Civic Art Museum, Kawage, Japan (2013) and One Thing After Another, Hoults Yar, Newcastle (2012).